The weekend starts early around here, because there’s a ton of stuff going on in Louisville, Lexington and all around. So even though we haven’t done an event listing post in a while, let’s get started! First off, tonight at Skull Alley (1017 E. Broadway), Mose Giganticus, Emotron, Mowgli! and the Robot Affair play at 7 PM, for $5. We don’t know anything about these bands, but we like Skull Alley, so there. Oh, it’s also all-ages. Our friends at Backseat Sandbar have an interview with Vetiver’s Andy Cabic you can read here. Also tonight in Lexington, our faves Hair Police, noise goddess Leslie Keffer, local weirdos Caboladies and Laloux are playing at the Cat’s Den, inside the UK Student Center at 8 PM. It’s all-ages and it’s FREE! Friday night the 2nd Annual Deck The Halls show of skateboard art opens at Derby City Espresso, 331 E. Market Street. Ben Purdom & the Swedish Eagles will be providing live music, starting at 10 PM and it’s free. Also Friday night Julia Christensen’s Big Box Reuse show opens at the Green Building Gallery (as we told you about yesterday). 732 E. Market Street, 5 to 9 PM, free. Saturday at the Rudyard Kipling, Straight A’s, Toads and Mice and Siberia will play, starting at 10 PM for $5. Our friend Brett Holsclaw (of the Glasspack) will be djing between bands. Also Saturday at Lisa’s Oak Street Lounge (1006 E Oak St), New York friends D. Charles Speer & The Helix (featuring members of No Neck Blues Band and Sunburned Hand of the Man) will be playing with recent arrival Zak Riles (of Grails), Twos & Fews label proprietor (and our good friend) Nathan Salsburg, and R. Keenan Lawler. If you miss them in Louisville (and you really shouldn’t! ), D. Charles Speer & The Helix will play Lexington on Sunday, December 7th with Warmer Milks at Al’s Bar, 6th and N. Limestone, at 9 PM, $4, all-ages. Saturday night in Louisville also brings the TRAFOZSATSFM release show at Skull Alley with the Phantom Family Halo, the Slow Break, IamIs, Whistle Peak, Trophy Wives, and Six White Horses. TRAFOZSATSFM is the local tribute album to David Bowie’s Ziggy Stardust and the Spiders from Mars, curated by John King. The show starts at 8 PM and is $5. Finally, Saturday night also is the opening of Sarah Lyon‘s 2009 Female Mechanics Calendar at the Green Building, 732 E. Market Street, 5 PM to 9 PM, and featuring music spun by DJ Kim Sorise. And of course it’s FREE! Whew! That’s a lot of stuff. Get out there! Hey there dear readers, we decided to bring back a feature we haven’t posted in a while, namely Music This Weekend, an incomplete guide to good stuff to hear (and see) in Louisville and nearby cities. And what a weekend we’ve got, so let’s get started! Tonight at our other place of employment, the excellent ear X-tacy Records, Mr. John Hiatt will be playing a free in-store at 6 PM. Ear X-tacy’s located at 1534 Bardstown Road, in the Highlands. He’ll also be on WFPK in a few minutes (if we publish this post after noon, sue us), so check that out as well. Metal fans will be glad to note that Nightwish and Sonic Syndicate are playing Headliners tonight at 8 PM. Headliners is located at 1386 Lexington Road, and tickets are available at ear X-tacy, by calling 502-584-8088, or at the door for $25 ($26 at ear X-tacy while still available). Saturday night brings a whole bucket full o’ good shows all over town, and at a variety of price points. We’ll be seeing Mudhoney (above photo from subpop.com), Detroit’s Easy Action and Louisville’s own Phantom Family Halo at Headliners, where the show starts at 8 PM and costs a whopping $15 ($16 at ear X-tacy). Later that night, there’s also a blisterin’, ear-bleedin’, whiskey-drinkin’, great time of a show at the Pour Haus, as Bodeco marks a triumphant return from a nine-month gigging absence. Local heavies the Glasspack and Lexington newcomers Nightshades open, $6, with doors at 10 PM. 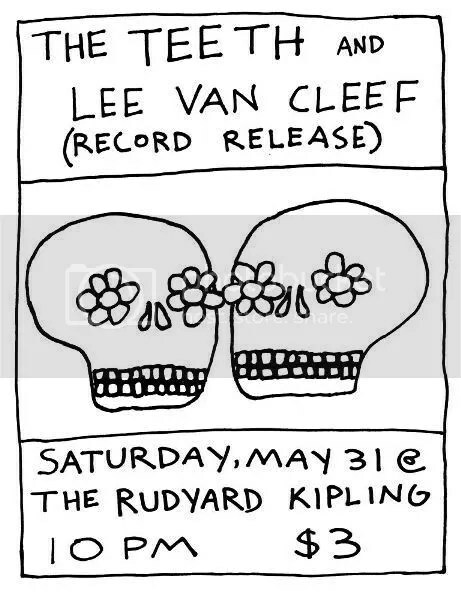 The Teeth and Lee Van Cleef will play the Rudyard Kipling Saturday night to boot, with doors at 10 PM and the entry a low, low $3. Nearby to the Rud, at the excellent Sixth and Oak art space (still no name? 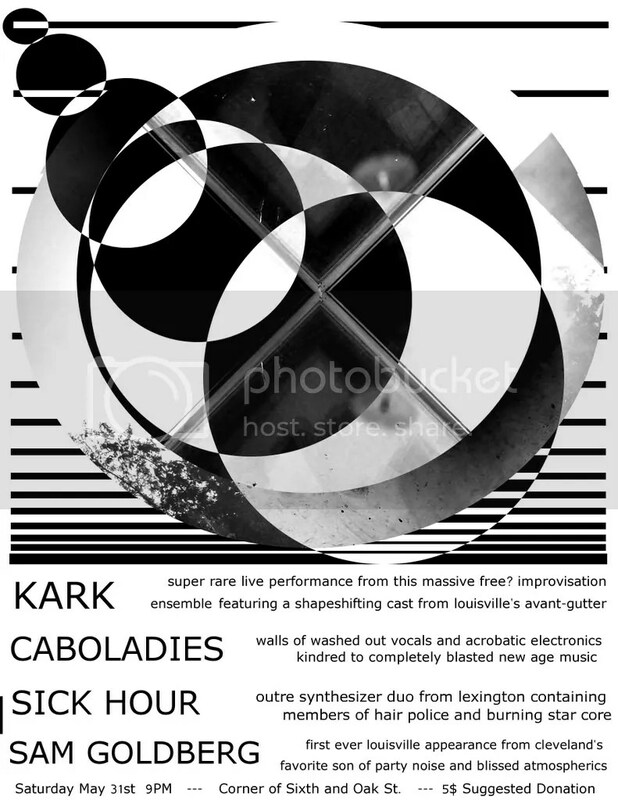 ), the Sapat-related psychedelic ensemble KARK plays with Lexington/Louisville noise duo Caboladies, Lexington synth duo Sick Hour (Robert and Trevor from Hair Police), and Cleveland’s Sam Goldberg. The show starts at 9 PM, and there’s a $5 suggested donation (gas is expensive for touring bands, don’tchaknow?). Speaking of Lexington, Caboladies and Sam Goldberg will play the Void Skateshop there on Sunday with Street Narcotic (try googling that!) and Three Legged Race. Details are at charlesmansion.org. Whew! That’s a lot of stuff to get out there and see! So we hope to see you out and about this weekend! Yes, we’ve been AWOL lately. not having posted since April 21! It’s terrible, really. Not only did we not run a What’s In the Weeklies? column last Wednesday, but we also haven’t run a Music This Weekend column either, or anything else aside from, hey, Antiques Roadshow. But we promise we’ll get back in the swing of things, soon. D. Charles Speer and the Helix are a newer band from New York featuring members of the No Neck Blues Band and Sunburned Hand of the Man, but unlike those two groups the Helix has more of a country-rock feel. Dare we say it, they remind us of an amalgamation of Gram Parsons and perhaps even the Grateful Dead. If you missed them in Louisville last night, which you probably did, you can check them out in Lexington tonight at the Dame. The show starts at 9 pm, is $6, and features Lexington locals Warmer Milks. So what are you waiting for? You are currently browsing the archives for the Lexington category.